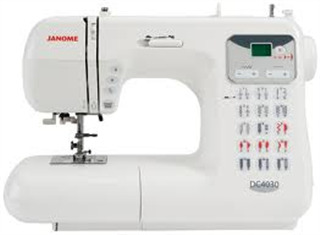 The Janome DC4030 is a computerized multi-purpose machine capable of both delicate work as well has most heavy duty sewing tasks. The machine has large selection buttons making it easy to select the type and style of stitch you want. It's affordable price doesn't mean you loose out of quality because as with all Janome machines you're guaranteed quality results. In total it has 30 stitches, 6 one-step buttonholes, a built-in One-Hand Needle Threader and Stitch Width and Length adjustments. There is also a Stitch Elongation feature which means you can elongate your stitches without losing any density as you go along.